Here we show you how to solve the problems you might encounter when designing a compression spring by using logic and certain compression spring calculations. There are many parameters that must be taken into consideration when designing a compression spring. From its physical dimensions to its force and elasticity. 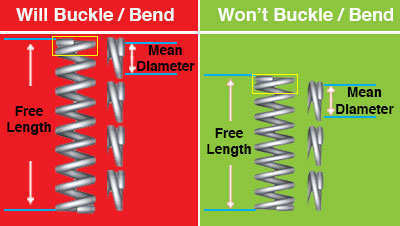 This is why we’ve written down a few problems and tips on compression spring design problems. Your index is too small (below 4) which makes it difficult to manufacture. Spring index determines the tightness of your compression spring’s coils. The way to calculate spring index is by dividing the mean diameter (outer diameter minus wire diameter or inner diameter plus wire diameter) by the wire diameter. This will help the engineer know the difficulty of manufacturing this certain spring. If the spring index is below 4, it’s too small (non-manufacturable). If it is over 15, it might be too large depending on the size and manufacturing capabilities of the spring company. To fix this issue, adjust either the outer diameter or the wire diameter to make sure that the compression spring’s index is larger or smaller. Your spring may bend or buckle. This is an issue that comes up a lot. If your compression spring has a slenderness ratio over 4, there is a big possibility that it’ll buckle. The slenderness ratio, is the proportion between your compression spring’s mean diameter and free length. Because the spring looses balance due to the high contrast between the compression spring’s diameter and free length. In order to calculate the slenderness ratio of the compression spring you must divide the free length by the mean diameter. If the result is greater than 4, your spring will bend/buckle. To resolve this problem you must either make the outer diameter larger, shorten the free length, go with a non-linear spring (conical or barrel spring) or put it in a hole or over a shaft. Your loaded height exceeds the maximum safe travel. Your load exceeds the maximum safe load. Some spring designs have a certain elastic limit which doesn’t allow for the compression spring to safely travel down to solid height or to a desired loaded height. The best way to solve this is to make adjustments to the wire diameter, total coils, and outer diameter to a point where you’ll still be able to meet your working loads so the spring is under less stress, thus being able to travel more. The elastic limit of a compression spring is based on its physical dimensions and material type. Loaded height and solid height conflict. Your loaded height cannot go beyond your solid height because once you’ve reached solid height all of your spring’s coils are touching and your compression spring is not able to travel or compress any further. To fix this issue you can either decrease the total coils, decrease the wire diameter, or make the free length longer.